Any airbag retro fits done by DMC? Thread: Any airbag retro fits done by DMC? I looked at there site and don't see them doing any retrofit upgrades for safety reasons? I'm also scratching my head saying, If they are really a "New Car company" why don't they make some upgrades like they did with the seats? I think it would only help the brand and enhance desire to own one. There is a lot involved when it comes to air bags. Sensors. Computer. Air bag units. Wiring. And then there is testing. After all that, replacement and maintenance every time an 'air bag light' goes on. The cost of all this is most likely too great. ^adding to the cost, touching anything that affects the car's safety rating in any way is opening yourself up to a lawsuit. The fuel pump recall is a good example. I don't see how the risk would be profitable in the long-run. The engineering and testing to verify an SRS (Supplemental Restraint System) is prohibitive for a small company never mind the insurance that would be necessary to cover any Liability claims. If something like the Takata debacle happened it would wipe out DMC. In the regs for small manufacturers the SRS is not required just because of the huge costs involved. It was successfully argued it would prevent small manufacturers from existing in the first place if SRS was a requirement. That's pretty good for 1980. Air bag science and understanding was in an extremely primitive form 38 years ago. There's not a way to Simply retrofit airbags into a another vehicle, the setup and Design and even programming of an airbag system is down to the millisecond is not something you can just slap into another car like a different set of exhaust tips. At least not without millions of dollars of testing and engineering. I also read about the 40 mile an hour crash test video, the one that looks really horrific. The the car had a faulty door latch that they knew about but didn't to bother fix. That pretty much voided the entire test as the structural rigidity of the compartment cabin pretty much went down to nil. 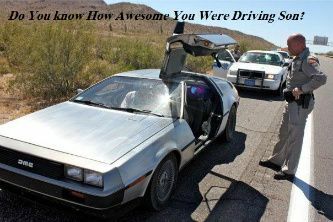 The only benefit of it was really only stressing the importance of having properly working door latches in case of a catastrophic accident in a Delorean. I think they were just betting on the airbag technology of the future to take care of everything. But putting an explosive in a kevlar pillow case wont be enough if you don't wear your seatbelt or properly latch your door. Remember this new low production bill is really only intersting or plausible to companies like DMC is because it does not require safety updates, just emission updates. LOL...would you seriously want an explosive bomb made by DMCH mounted 1 foot in front of your face? This is my exact thought. Not the DMCH part specifically, but just that I wouldn't want to ride in any car that had an air bag willy nilly stuffed up front. Automakers to extensive testing to be sure their airbags help people, instead of hurt them. Without testing, it's just a bomb inside of a bag like Michael said. Heck, even with testing you can still end up with issues; (as indicated by the airbag recalls on both my Ranger and my Civic). After typing this out, I'm now also assuming there there are likely DOT and legal reasons why DMCH couldn't simply add airbags to the car without an excessive amount of design and testing. Never going to happen. There's a reason why PepBoys sell aftermarket reversing cameras, HUDs, LED lighting and "carbon fiber" parts and not aftermarket airbags. Driving entails risk. Buckle up and proceed accordingly.